Trumpeter/composer Samantha Boshnack has produced an all-world music feast with her chamber orchestra B’shnorkestra, a 14-piece collective, formed in 2011, merging cross-cultural musicians from Seattle’s many music communities. 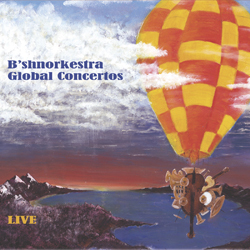 For B’shnorkestra’s second new album Global Concertos, Boshnack spans out to five continents, composing five new concertos for five distinct soloists. Under the direction of conductor Joshua Kohl, the project opens with a freedom song inviting the Hindustani vocals of Srivani Jade. Lyrically based on a visionary poem of a united world and spiritual unity, the musical landscape of “Prarthona” evolves to include modal transitions and melodic lines passed between instrumental voices. “Concerto for Julio,” written for Latin jazz piano master Julio Jáuregui, delves into ethereal harmonies and accelerando samba. Backed by wailing strings, Jauregui plays a transcendent solo before theme material develops into a spacey conclusion. The third piece showcases the tradition of Greek clarinet, bringing the talents of Christos Govetas front and center of Boshnack’s brilliant blues-inspired composition. “Concerto for Christos” weaves around an entrancing drone of bass and cello, pizzicato texture, and open horn harmonies, before Govetas leads the band into an illustrious and contemplative celebration. 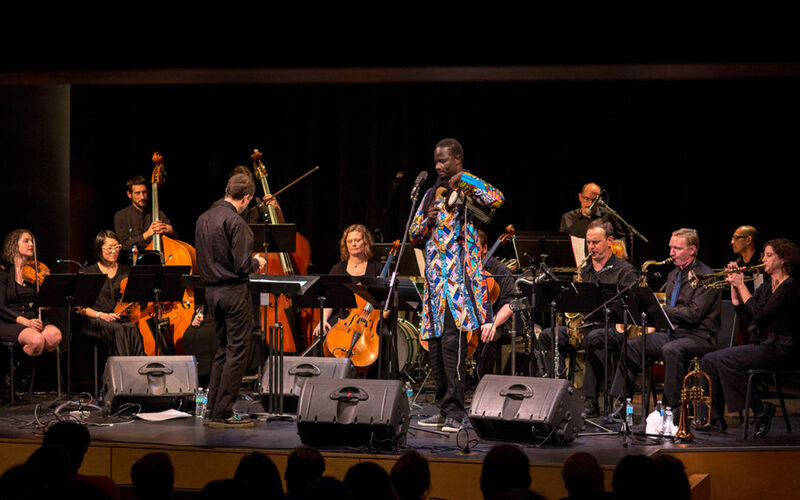 The rhythmic intensity of the album peaks with “Concerto for Talking Drum,” featuring West African talking drum by Thione Diop, descendant from an ancestral line of Griot drummers from Senegal. Here, Boshnack leads strong trumpet and saxophone lines inspired by African jazz. Diop’s expressive soloing and sheer virtuosity fuel the high-energy piece. Concluding the album is Boshnack’s stellar jazz trumpet concerto featuring the prolific Thomas Marriott. Timeless harmonies abound, and atop them Marriott sends chills with upper register lines and expressive phrasing all his own. A sense of boundless – and borderless – creative improvisation infuses Boshnack’s cinematic compositions; her musical feat cannot be overlooked or overplayed. Saxophonist Kareem Kandi – Northwest favorite and a key figure in Tacoma’s jazz scene – is known for his classic tones and straight-ahead approach. When joined by the rich harmonies of B3 organist Delvon Lamarr and the rhythmic punctuations of D’Vonne Lewis, a be-bop soul force is born. A versatile jazz/funk trio, The Kareem Kandi Band has self-released a new album Hourglass, a balance of three originals and three remakes of popular standards (John Coltrane’s “Impressions,” Hoagy Carmichael’s “Stardust,” and Josef Myrow’s “You Make Me Feel So Young.”) The boys come out of the gate with a juicy, funk-filled version of “Impressions,” as if Coltrane were to have combined visions with Reuben Wilson. By the third track “Curvaceous,” they’ve channeled a more playful, R&B spirit. 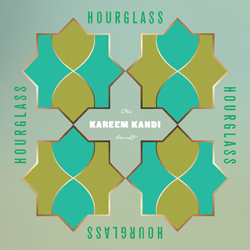 The group embraces mellow vibes on both the killer rendition of “Stardust” and “Hourglass.” Kandi’s warm tone sings the timeless melody of “Stardust,” and Lamarr adds a fresh spin with lush organ chords. On their title track, Lewis mesmerizes with snare rolls and a Latin-influenced groove. “Guess Again” is a tight funk anthem the group has been performing together since last summer (including a feature on KNKX radio), making for a rock-solid and memorable recording. Kandi’s soulful riffs are perfectly balanced by Lamarr’s slick basslines. A noteworthy bridge blends into a buttery organ solo, where Lamarr is complemented by Lewis’ gregarious interplay. The band brings it home with their swinging up-tempo version of “You Make Me Feel So Young,” twice Myrow’s original tempo. The trio more than proves themselves of their top-notch be-bop abilities, all the while playing with ease and an unteachable chemistry. Guitarist and composer Gregg Belisle-Chi has emerged as one of the Northwest’s most creatively dexterous musicians, intuitively spanning varied scenes from improvisational chamber music to the experimental edge of pop/rock songwriting. Informed by jazz but evading direct connections and conventions, Belisle-Chi’s work shares some sonic and conceptual territory with his own recent work in Andy Clausen’s Shutter Project as well as occasional mentor Bill Frisell. 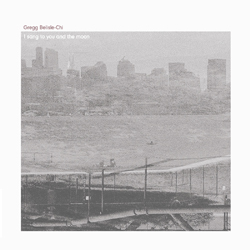 Belisle-Chi’s superb new album, I Sang to You and the Moon, builds on elements he began to explore in his 2015 debut, Tenebrae: a literary and harmonically sophisticated, almost spiritual approach to songwriting. Both albums share a patient, ethereal quality, but Tenebrae occupied a more somber and austere space, while the new album dwells in more warmly earthy realms. Belisle-Chi’s new compositions are set to the words of iconic American poet (and folk singer) Carl Sandburg. The music explores approachable tonalities and melodies while following the contours of the words and their own peculiarly winding logic. The songs are uniformly beautiful, powerful, and memorable, whether exploring more eerie suite-like cinematic moods (“Dream Girl”) or elemental heartland trance (“Bringers”). There is something inherently powerful about a technically skilled and ambitious composer/musician applying his efforts to focusing and simplifying, as I Sang to You and the Moon poetically demonstrates. The guitar-centered forms are embroidered with superbly sensitive collaborator contributions: Chelsea Crabtree’s powerful and intimate yet otherworldly vocals, Carmen Rothwell’s woody bass (channeling a bit of the spirit of Charlie Haden), and Raymond Larsen’s smeary, poignant trumpet. 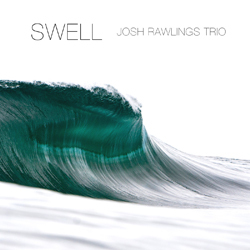 Emerging from the improvisational depths of the Green Leaf, the Josh Rawlings Trio, featuring Adam Kessler on drums and Nate Omdal on upright bass, recently released their new album Swell. Keyboardist Rawlings’ playful compositions, creative arrangements, and curatorial skills provide a light-hearted sonosphere packed with talented guests artists. The secret sauce of the trio is perhaps their ability to steadily transition in and out of multi-genre inspired grooves resulting in layers of subtle sonic variation. Their song selection and pacing make Swell one of the most listenable records I’ve heard this year. Swell also features several popular songs including Stevie Wonder’s “Pastime Paradise,” Weezer’s “Undone” and “Say It Ain’t So,” and a Seattle favorite, Nirvana’s “Smells Like Teen Spirit.” Rawlings delivers his cool and dark textures for these covers a la Ethan Iverson (The Bad Plus).